It turns out that using benzodiazepines regularly for a long period of time can result in growing mental and physical health issues. Benzodiazepines are compounds that provide both sedative and hypnotic effects. A scientific study conducted seven years ago has shown that the use of benzodiazepines for a long time is directly linked to the increased risk of developing risk of developing dementia. That’s why the team behind this study concluded that senior citizens should not practice long-term use of these medications because the chances of developing such problems in these patients are much higher. That is why it is recommended to use St. John’s Wort for anxiety and depression. The study included adults over the age of 65 and those participants that have taken benzodiazepines had 50% greater chances of developing dementia in a period of 15 years. It was proven that over some period of time, benzodiazepines buildup in the body and this occurrence can also lead to unintentional overdose. If you are looking for an alternative, you can try St. John’s wort. A study published a few months ago, conducted by a team of experts from St. James’ University Hospital in Leeds, UK, has confirmed that St. John’s wort is a herbal supplement that provides significant positive effect when it comes to treating depression and anxiety. There were few other herbal supplements like gingko biloba, cat’s claw, royal jelly, liquid tonic and ginseng that were tested but none of them provided effects in health issues like this except St John’s wort. This herb has been part of folk medicine for centuries and it was mainly used for calming anxiety and other mental problems. As a matter of fact, doctors in Germany prescribe concentrate of St. John’s Wort for anxiety and depression. St. John’s wort has proven to be useful for hundreds of people. In case you are wondering how this plant got its name, you should know that the bloom season is close to June 24 which is the day when the birthday of St. John the Baptist is marked. This plant brings many other health benefits. For example, it is able to stabilize metabolism and acts as an anti-inflammatory and diuretic agent. St. John’s wort is also a good purifier and astringent. This plant also supports proper heart contractions and aids the process of repair of nervous tissues. It seems that modern science has still not discovered all the health benefits of this interesting plant. In case you tear a leaf of this plant and simply rub it with your fingers, you will notice the red color. This color comes as a result of a specific compound found in St. John’s wort, which is located in the black dots of this plant known as hypericin. This compound is especially efficient for treating depression and other similar disease and the best part is that it doesn’t come with any side effects. In addition, beside that we use St. John’s Wort for anxiety, it is often used as a great hemostatic, anti-inflammatory and tonic medicine. A few types of vitamins, rutin and ascorbic acid and carotene which supports the natural production of vitamin A in the body. It prevents damage and premature aging of the nails, hair and skin. In addition, it also contains vitamin PP also known as nicotinic acid which supports the exchange between carbs and protein. Essential oils – fragrant unstable compounds that provide anti-inflammatory, antimicrobial and other useful effects. Tannins (tannin compounds) – fragrant anazotic substances with a specific flavor and both antimicrobial and astringent properties. Resinous compounds – semi-solid or solid organic substances with a specific scent. They come with a chemical structure similar to the one found in essential oils. Phytoncides – unstable compounds that provide antimicrobial effects. 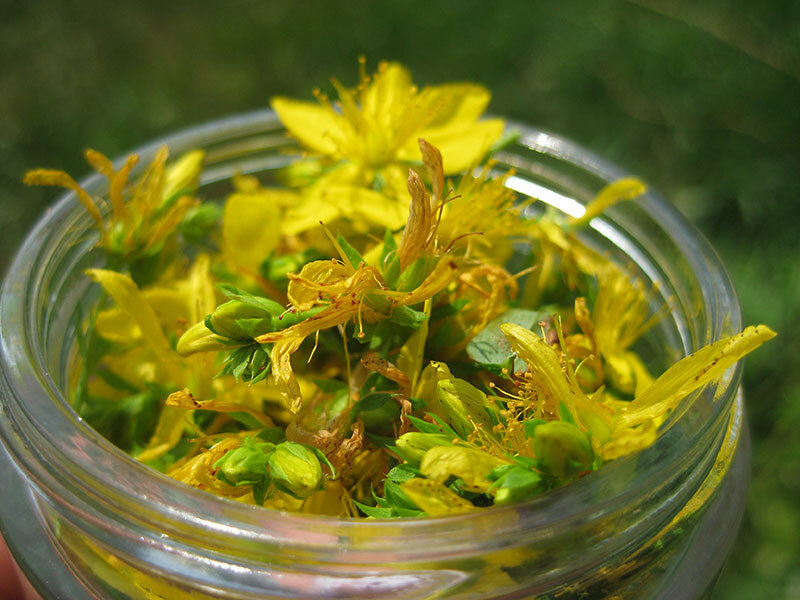 How is St. John’s Wort Used in Traditional Medicine? When it comes to traditional medicine, this plant is usually used in cases of inflammation of the stomach also known as gastritis, duodenal and stomach ulcers, diarrhea, inflammation of the large intestine or colitis, bile passage problems, liver disease, kidney diseases, heart problems and urinary tract infections and diseases. Many people use St. John’s wort a natural sedative in cases of insomnia and migraines. St. John’s wort contains imanin too. This compound has the ability to inhibit the expansion of bacteria. Imanin provides the antiseptic and anti-inflammatory properties in this plant. St. John’s wort also contains bioflavonoids that are useful for individuals suffering from swollen veins. This plant’s extracts are helpful in cases of joint diseases regardless of their cause. These extracts ease swelling and inflammation and act as natural pain killers. St. John’s wort decoctions and external infusions have proven to be useful for treating burns, wounds and mastitis. In case you are suffering from throat-related diseases and health issues related to the mucous membranes located in the oral cavity you can use extracts of this plant. They can also be used to soothe premenstrual and menstrual symptoms. St. John’s wort tea relaxes the muscles and supports the activity of many different glands, improves appetite, triggers tissue regeneration and soothes both menopause and PMS signs and symptoms. This interesting plant can be used as herbal healing tea, extract and tincture. When it comes to cosmetology, St. John’s wort is usually used for cleansing oily skin, clogged pores, persistent acne and for hydrating and taking care of the skin.